19-22 nov 2015: Eli Gras artist-in-residence at De Perifeer | Esc.rec. Eli Gras is a multidisciplinary artist from Barcelona, with a career in experimental and underground music since the early 80s. 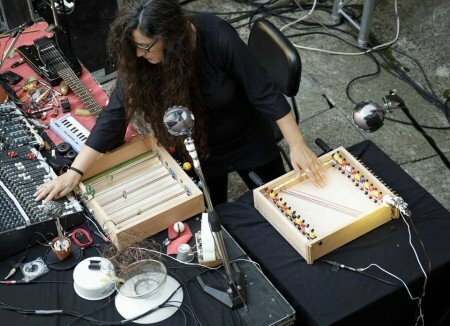 Musically, she has come a long way via traditional Greek music, minimalism, folk, choral, noise, electro pop and free electronica, but her music practice is now mainly focused on experimental improvisation. Her work has been described as ‘scientific bricolage music’. She frequently performs with self-invented instruments, in which visual elements can be just as important as the sounds they produce. She played together with artists like Hans Joachim Roedelius, Pierre Bastien, Jaki Liebezeit and David Fenech. She is the founder of the NoNoLogic festival and record label La Olla Expréss. Eli Gras will be working on an instrument/object to be used in a live performance in De Perifeer: ACSH #42 on November 22nd (read more here). Afterwards her (edited) recording of this performance and the instrument/object she created are merged in an extremely limited Esc.rec. release, in the Sediment series. During her work period in De Perifeer, Eli Gras will be sleeping in Lucy PWR, designed by Maurer Architects & Boris Tellegen. For the time being LucyPWR is located on a free lot in between a new housing plot, which just happens to be 100 meters down the street from De Perifeer. Couldn’t be better! Thank you Lucy and Havenkwartier Deventer, for making this possible. This project is financially supported by Mondriaan Fund.